XiMpLe is an xml editor based on a table grid view (the same nodes are arranged in tables). The editor is free for non-commercial use and it can be used without installation. There are now available also XML splitter and XML joiner for large xml files. Simple and minimal preparation: just download the exe file (one file, approximately 0.6MB), place it somewhere on your hard disk or flash-drive and run it. It should run on Windows XP (32 bit only), Win 7, 8 and 10 (.NET Framework 3.5 is required). Do you need to edit xml files and you don't want to care about xml rules? Is your xml file too complex or without spaces and it's hard to read it in a text editor? Do you need to edit a big xml file in a comfortable way? Do you want to try some special and tailored functions? Use XiMpLe and you will not regret. No installation is required - just download one file and run it. 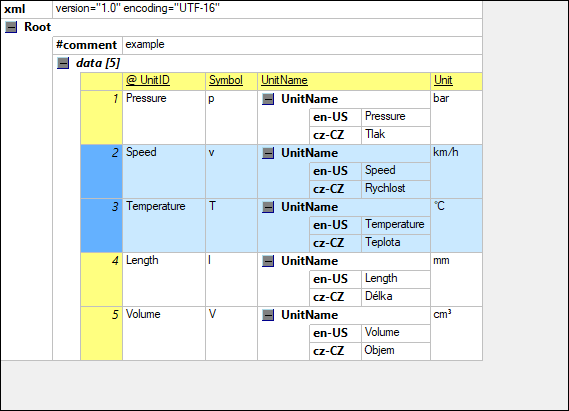 Xml data are presented in well-arranged tables. Simple and intuitive control even for a beginner. No need to know xml rules or syntax. Special sub-tables for mining nested data inside a table. Transparent clipboard operations in a text mode only. Searching and replacing texts with a possibility to use wild cards. Replacing texts based on a lookup table defined in an external xml file. Wide range of configurations for editor appearance and output file shaping. XML splitter for big files (as ximple as possible). XML joiner to link it back together (as flexible as possible). User's guide available for free in a download section. Surprisingly there were only a few editors which display xml data in tables. And in this small set I didn't find any free (or cheap) editor which was able to fulfil my requirements (the professional ones were quite expensive maybe because they contain many additional functions for transformations and other stuffs which I didn't need). Thus I started to develop the xml editor to make my work easier.